The free and voluntary course—only open to those enrolled in Humanities 10— took students through the novel and allowed for discussion on its themes such as government censorship and Irish politics, according to English Ph.D. candidate Miles A.F. Osgood, the course’s creator and instructor. 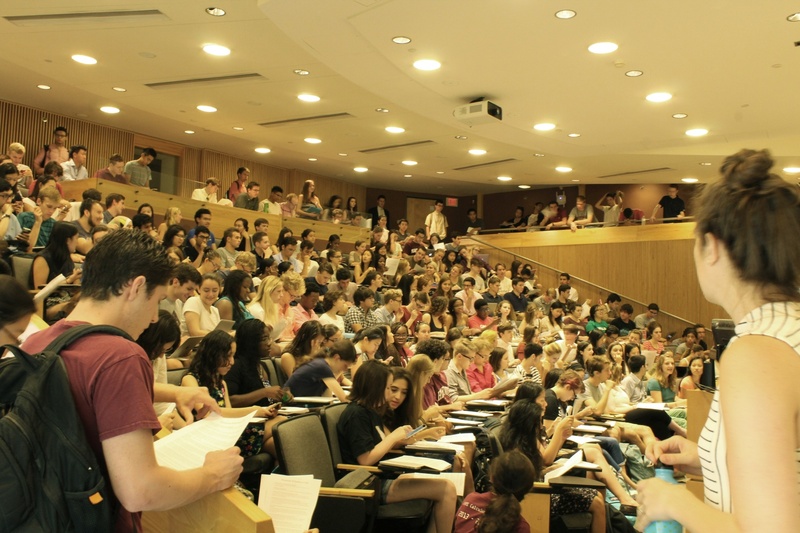 Students crowded Fong Auditorium for the first meeting of Humanities 10 in 2015. Osgood said he chose “Ulysses” because of its complexity. All Humanities 10 students are required to read the book during their winter break, but are allowed to opt into the Wintersession course. “I thought by going in a week early to talk about the book with other people who were excited about it, it would help me be set for next semester and take away more from the book than I would from just reading it for three weeks in class,” said Hillary Mclauchlin ’20, who took the course. Osgood’s course was part of a series of Wintersession offerings, a set of weeklong workshops on topics ranging from computer science to clay printmaking. Humanities 10 students who took the course said they enjoyed its size and subject matter. “I would say the size was absolutely perfect. We had enough people that the views were fresh. At the same time, it was small enough that everyone could participate in the conversation,” Lauren D. Spohn ’20 said. In total, 24 students attended throughout the week, a large increase from the 10 that took the course last year when it was offered for the first time. The course had separate morning and afternoon sections, both taught by Osgood. Students spent two or three hours per a day in class. According to Osgood, before coming to class students watched videotaped lectures, so the entire class period could be dedicated to discussion. Thomas W. Burke ’20 said the class’s trip to Houghton Library, the home of Harvard’s rare books and manuscripts, was incredibly helpful in understanding “Ulysses.” Burke added that reading primary sources from James Joyce’s lifetime helped him understand the novel’s setting. Osgood said their trip to Houghton Library may also help Humanities 10 students conduct research for a required paper on “Ulysses” due later this semester. At the end of the week, students presented projects meant to engage creatively with the novel. Students’ projects ranged from a parody Twitter account to a chalk portrait of one of the book’s main characters. “We had a blast doing the final project. It allowed us to engage with ‘Ulysses’ in a creative way causing us to understand it more,” Spohn said. Osgood said he was pleased with the course’s size, although he may consider opening it to non-Humanities 10 students in the future. “I really enjoyed easing back into school with one class. I would definitely consider doing another course next year,” Mclauchlin said. Game in New York Today.